NEW ORLEANS – The Hoyas of Georgetown University are the USTFCCCA NCAA Division I Women’s Scholar Team of the Year for the 2011 cross country season as announced Monday by the U.S. Track & Field and Cross Country Coaches Association (USTFCCCA). Georgetown captured their first NCAA title in women’s cross country this past fall. 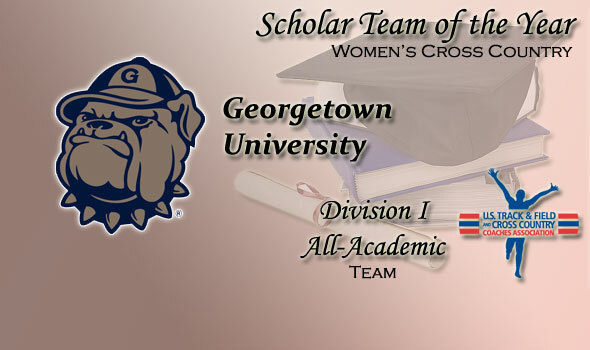 Georgetown’s squad, coached by Chris Miltenberg, has a cumulative GPA of 3.28 through the fall 2011 semester. Georgetown won the NCAA crown for the first time in school history, tallying 162 points to hold off a tightly-packed bunch that included runner-up Washington (170), third-place and two-time defending champion Villanova (181), and No. 1-ranked Florida State (189). Georgetown’s eight-point margin of victory is the lowest since 2003 when Stanford’s 120 points edged out BYU with 128. Earlier in the season, Georgetown tied with Villanova for the NCAA Mid-Atlantic Regional crown and finished third in the Big East Championships. Squad members Claire Richardson, Emily Jones, and Katrina Coogan were named as individual All-Academic honorees last week. Richardson and Jones were Georgetown’s second and third scorers at the NCAA Championships, respectively. In addition to the Scholar Team of the Year, the USTFCCCA also announced those women’s teams who earned 2011 Division I All-Academic Cross Country status. A total of 205 institutions represent 30 conferences that compose the group. To lead all conferences, 14 teams from the Big East Conference earned All-Academic nods. The Pac-12 followed with 11. Alabama reported the nation’s highest cumulative team GPA (3.83), followed by Southern Miss (3.80). Nine of the top ten finishing teams at the 2011 NCAA Cross Country Championships earned All-Academic status. Of the 31 teams that participated in the national final, 26 of those earned All-Academic status. To qualify as a USTFCCCA All-Academic Cross Country Team, the team must have had a cumulative team GPA of 3.00 or better and have started at least five runners at their respective NCAA regional championship.